Whether you’re a cycling enthusiast or just enjoy the occasional bike ride once in a while, Bike and Hike Oman has plenty of cycling holidays to suit every ability. Grading our bike holidays from easy to challenging, taking into account distances, terrain, altitude and ascent ensure you can choose the correct tour according to your desires. We believe that a cycling holiday is the best way to completely immerse yourself in your destination. On these tours you will experience incredible experiences that you will remember for years to come. 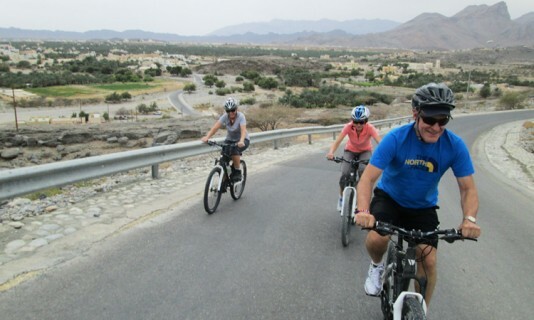 Bike and Hike Oman offer an amazing range of cycling trips to experience. You could discover awe-inspiring views from a winding mountain path or traverse through the labyrinth like bustling streets of the town. Our small group cycling tours are ideal if you want to meet new people and would prefer a tour leader take care of all the daily arrangements. To be as flexible and unobtrusive as possible, we cycle in small groups, usually between 3-10 people who are accompanied by a specially trained tour leader whose knowledge of the route and passion for the destination will ensure you get the very most from your cycling holiday in Oman. If you prefer to travel just with family or friends and be more independent, we also offer solo and small group cycling tours.